(Stratford, PE) Murphy’s Pharmacies will open its second healthcare hub in Stratford, PE in March 2019. Murphy’s Kinlock Pharmacy & Medical Centre will be part of the new Kinlock Crossing development. 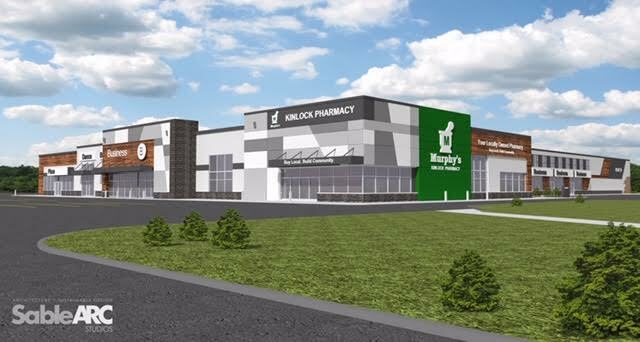 The former Home Hardware location at 14 Kinlock Road has been redeveloped into a 10 unit commercial complex that will feature a mix of different businesses, including the new Murphy’s Pharmacies location as its anchor tenant. Murphy’s will offer healthcare services focused on disease management and illness prevention including pharmacist prescribing, customized medication, vaccination education and administration, quitting smoking, as well as tailored programs focused on specific health conditions such as heart health, diabetes, pain management, hormone health, and weight management. Click here to learn more about our healthcare services. Murphy’s is in discussions with physicians and other healthcare professionals about final plans for the medical centre portion of the development.